Align Probiotic Supplements are the #1 Gastroenterologist Recommended Probiotic. Align probiotic supplements contain Bifidobacterium longum subsp. infantis 35624, the pure-strain probiotic bacteria that relieves and manages IBS symptoms. This strain was developed by leading gastroenterologists and, when taken daily, provides ongoing relief of IBS symptoms such as abdominal discomfort, gas, and bloating. 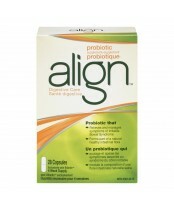 In Canada, Align probiotics are a popular choice amongst those with Irritable Bowel Syndrome.